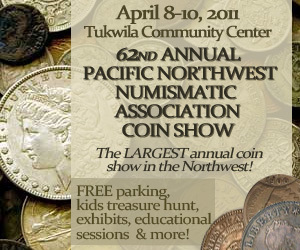 The biggest annual coin show in the Pacific Northwest, sponsored by the Pacific Northwest Numismatic Association (PNNA) and now in its 11th year in Tukwila, was once again a big success, with strong attendance especially on Friday and Saturday. Total three-day attendance was estimated at well over 1,000. Activity was strong, and not just due to high bullion prices; collector coins, tokens and medals also did well. See the convention program with dealer list (PDF file). 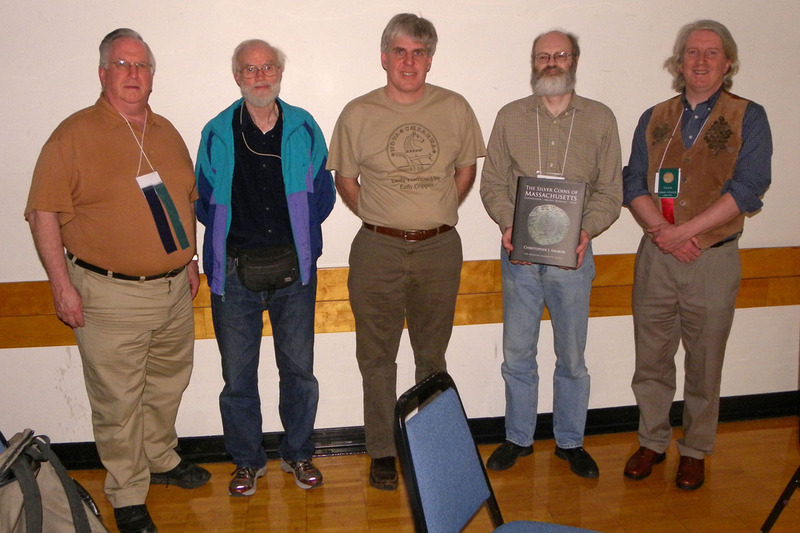 Speakers, award winners and attendees at one of the popular club meetings are pictured below. 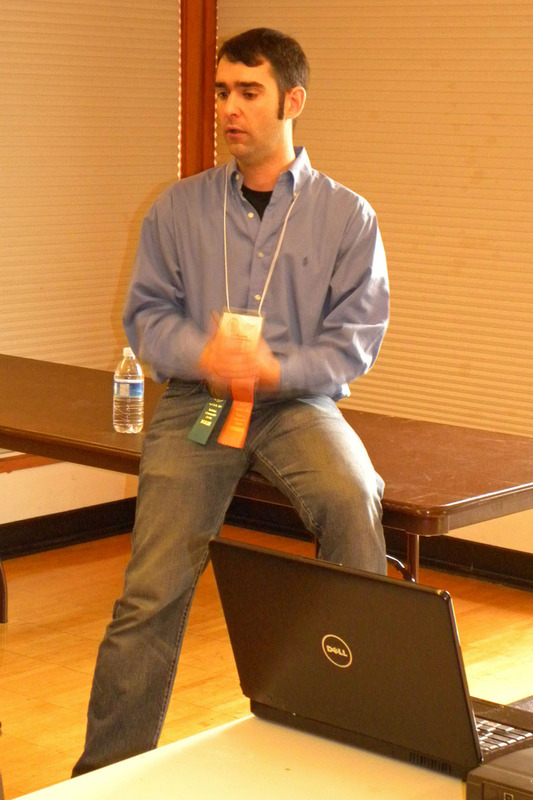 Boy and Girl Scout workshops were conducted on Saturday by James Reinders. Although attendance was low (in part due to spring break), those who did attend reported a successful program. There were several collector exhibits this year, all of which were quite interesting! Attendees once again received custom designed and struck pewter "tokens" while supplies lasted! Special thanks to Mike Labosier for serving as general chairman for the 2011 convention. The PNNA is pleased to announce that the association's annual convention will again be held at the Tukwila Community Center, April 13-15, 2012. Attendees at the Colonial Coin Collectors Club (C4) meeting. The topic this year was Massachusetts Silver. 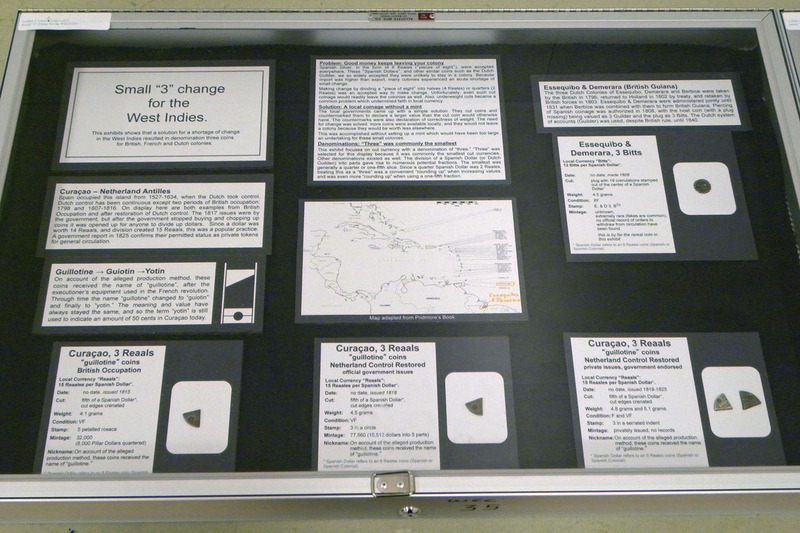 James Reinders won "Best of Show" for his two-case exhibit on Small "3" Change for the West Indies. Mike Labosier (left), PNNA treasurer and Tukwila convention general chairman, received the Bob Everett Memorial Award from award committee chairman Danny Bisgaard (right). Walt Ostromecki (right), who runs the PNNA's convention YN program, received the Nina Nystrom Memorial Goodwill Ambassador Award from PNNA President Lisa Loos (left). This year's keynote speaker was John Krajlevich. John is a well-respected professional numismatist and former outstanding ANA Young Numismatist. 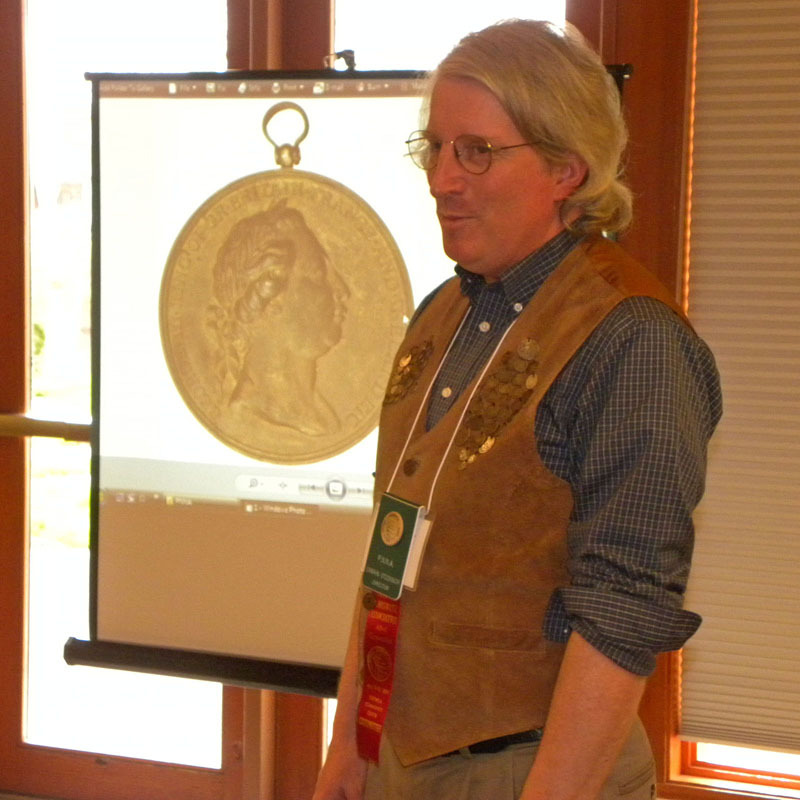 His topic was Before 54’40 or Fight: Numismatics of the Pacific Northwest, which covered interesting early Northwest numismatic items, including Indian peace medals and the 1820 Northwest Company token. 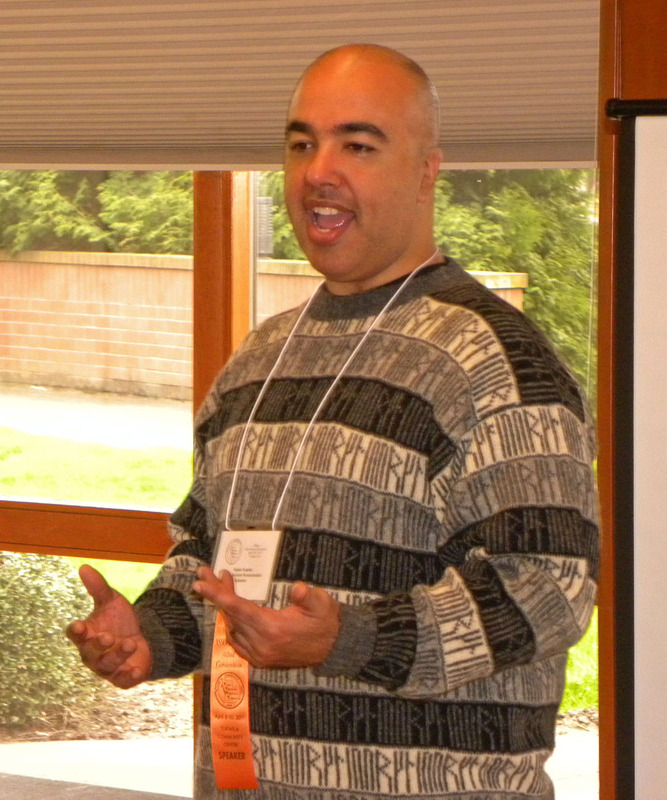 Rasiel Suarez spoke at the Pacific Ancient Numismatists meeting on The Process Involved in Authoring Numismatic Books. Suarez has himself authored two books on Roman coins, the latest of which was available at the show. 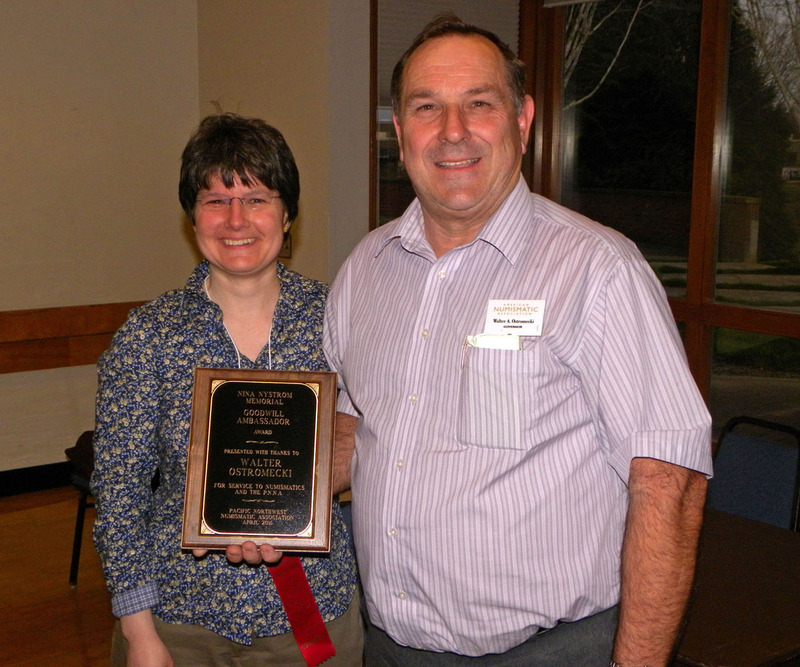 Lisa Loos (left) gives a PNNA Presidential Award to Rick Schulz (right). Rick has taken over as the PNNA's Puyallup Fair director, and is also organizing a PNNA club representative program. 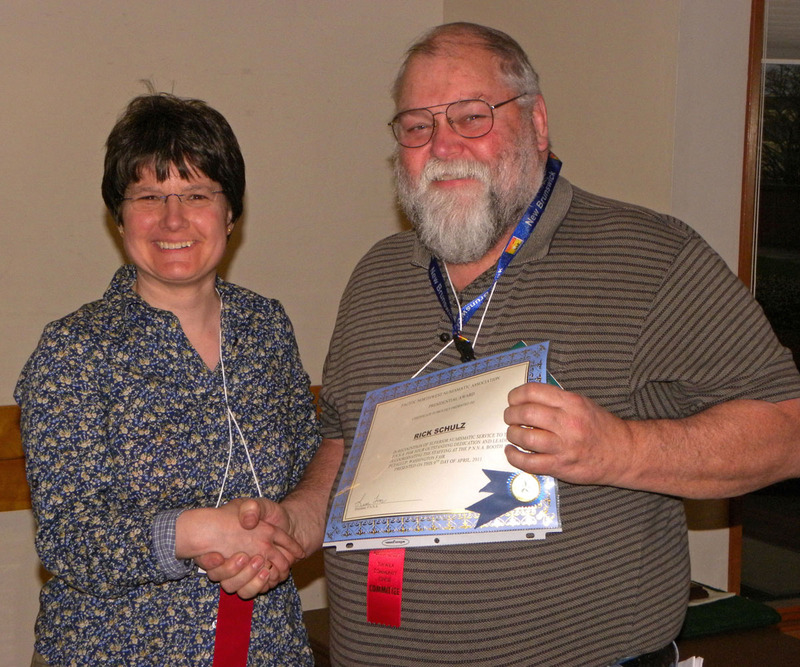 Gawain O'Connor, member of the PNNA's education committee, served as numismatic theater coordinator this year. A large crowd was on hand for the opening on Friday, April 8 of the 62nd Annual Pacific Northwest Numismatic Association (PNNA) spring convention held April 8-10 at the Tukwila Community Center just outside the city of Seattle, WA for the 11th consecutive year. Billed as the largest coin show in the Northwest, the sold out 90+ table bourse was extremely active from the Friday 12 noon opening until the 4 PM close on Sunday. Bourse Chair, Scott Loos, commented: "We had an opening day record attendance of over 400 between from noon until closing at 7PM. Both collectors and the public were definitely in hyper-drive buying mode, not just for anything silver, but collector medium grade type coins, tokens, medals, and paper money as well. 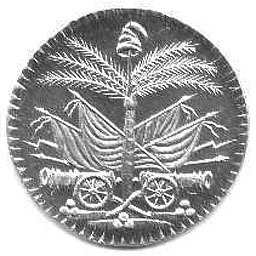 It’s hard to imagine that circulated silver dimes were trading at around 26 times face!" Silver bullion hit a market high of $41.26 on Friday. Long time coin dealer, Gene Henry, Issaquash, WA stated, " Silver bullion and raw state US Silver dollars were hot hot hot items for me! I have to make a special trip back to my shop on Friday afternoon just to pick up more silver dollar stock." Dennis Reed, Lacey Rare Coins, Olympia, WA commented: "Great public buying venue. Silver coins of all types and Morgan Dollars of all grades and types were literally being scooped up out of my show inventory at a very frenzied pace." Mark Gruner, perhaps, best summed up the bourse activity this way: "Best PNNA show I have ever had in the last five years. Sales were brisk!" Show general chairman, Mike Labosier, commented, "the PNNA is the largest collector show in the Pacific Northwest...and is committed to serving the diverse needs of the hobbyist as well as the all important educational outreach needs of the region. 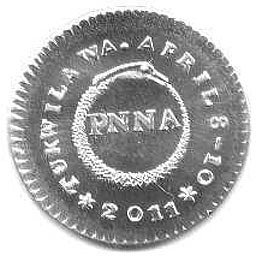 It offers a wide array of free numismatic-learning activities during shows such as: award competitive and interesting top notch collector and club exhibits; a free fun kid’s learning zone and a twelve stop treasure hunt program expertly conducted by ANA Governor Walt Ostromecki; a Boy & Girl Scout coin collecting clinic under the leadership of Assistant Scoutmaster, James Reinders; free public coin collecting basics program for new and non-collectors (adapted from the ANA’s) masterfully taught by PNNA Immediate Past President and long time numismatist, Larry Gaye." A wide variety of outstanding Numismatic Theater presentations, under the direction of Gawain O’Conner, took place on Saturday with the keynote forum ‘Before 54'40: Numismatics of the Early Northwest’ given by that renown, well known and enlightening professional numismatic scholar, John Kraljevich. His well-attended program was followed by three other outstanding ones: ‘The Process Involved in Authoring Numismatic Books' by Rasiel Suarez; ‘Buying and Selling on eBay’ with Eric Holcomb; and lastly ‘Numismatic Photography,’ conducted by Chip Van Gilder. Later that afternoon two coin collector clubs held meetings: The Silver Art Bar Collector’s Club, featuring a talk by Nancy Yee, President, and Buell Ish, of The Colonial Coin Collector’s Club (4C) speaking on Massachusetts Silver. Lisa Loos, with a gleeful smile, reported that the January 2011 joint PNNA-ANA Counterfeit Detection Seminar was a huge sold-out educational hit with local hobbyists. "Another is in the planning stages for some time in September or October." Committee reports by their respective chairs followed. Updates were provided to the membership on the new show sign boards; the implementation of a new PNNA member club literary award; the volunteer staffing and aims of the new Club Rep Program (similar to the ANA’s); the PNNA website redesign; the PNNA logo redesign; and the by-laws revisions which will be more focused on benefits for members and member clubs. Following the business portion of the meeting, PNNA President Lisa Loos was joined by VP and Awards Chairman, Danny Bisgaard. Kicking off the awards was the recognition of Rick Schulz with a PNNA Presidential Award for his ongoing service as coordinator of the PNNA yearly numismatic outreach efforts at the annual Puyallup Fair and organizing and heading the PNNA Club Representative Program. ANA Governor and PNNA member, Walt Ostromecki, who has run the Association's annual show youth educational activities since 1998 was recognized for his dedicated service with the Nina Nystrom Memorial Goodwill Ambassador Award. 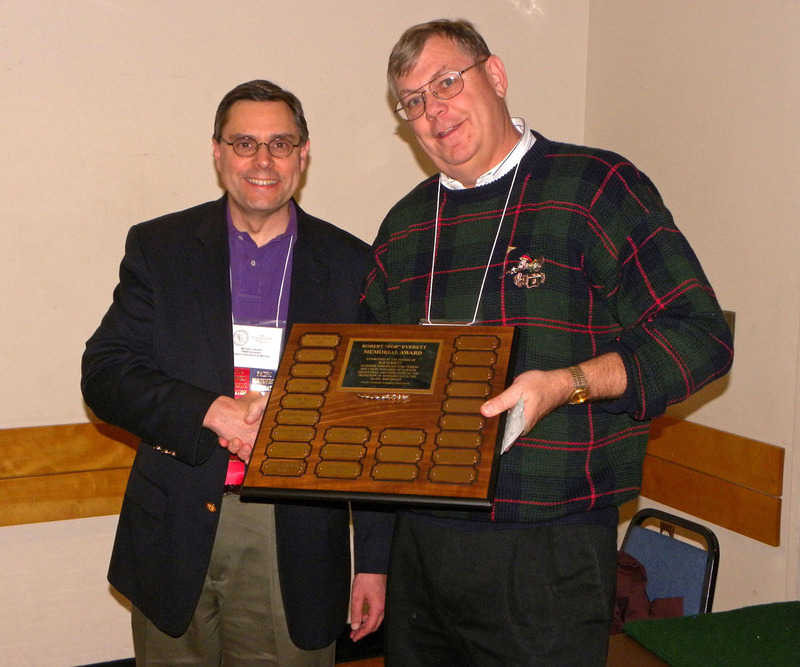 The PNNA’s highest and most prestigious honor, the Bob Everett Memorial Service Award, went to PNNA Secretary and 2011 Tukwila Convention Chairman, Mike Labosier. Five competitive exhibitors were awarded for their efforts. See the collector exhibit page for details.